This got a mention in one or two threads a little while ago. Is anyone else trying it? It's the thing where you hollow out the seeds from a marrow, pack it with brown sugar, and then hang it up to drip. I've just set one up (actually with an overgrown courgette). Getting the seeds out down the length of the marrow was a challenge, eventually managed with a carving fork, combined with pouring a little water in and shaking vigorously. Then put it in a net that previously held grapefruit, hung up from a hook screwed into the ceiling, over one of those big sweet-shop jars. Some recipes on he web say you should add yeast at some stage, others say nothing about this part. Not sure how it's going to turn out. I've made that on and off voer the years' I add rum and ferment it inot a rum-like drink,r ather than rum, if you see what I mean. Prizewinning or Runner Up (big) marrow with seeds removed, packed with brown sugar, juice of an orange squeezed in and teaspoon of dried yeast - put top of marrow back on (tape works). I've heard of some people adding root ginger, but I didn't find it needed it. Hang/rest in a bowl in a warm place and forget it for three or four weeks - this part takes longer than you think it should. Only when you get really convincing signs that the bottom is about to fall out is it ready to go to the next stage. Be ready for sticky mess and catch as much juice as poss. Cut off base of marrow and get as much of the sugar/marrow mix into a bowl as you can. It gives off an interesting scent at this point, not offensive but curiously non alcoholic. Sieve and funnel into demi-john, you can mash it a bit to get as much of the marrow flesh in as poss. Top the demi-john up to about three quarters full with cooled boiled water - barely luke-warm if you are in a hurry. 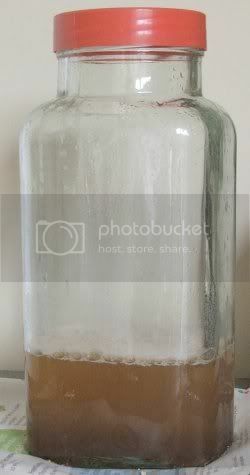 Add another teaspoon of dried yeast and juice of half an orange, bung it with a wine making airlock and put it at the back of an airing cupboard where you forget for weeks at a time, but its always warm and snug. Isn't it great, such fab wine making and half the art is in leaving it to do its own thing for the most part! In a year's time you should have about five pints of golden liquer-type rum, ready to filter off from the rubbish at the bottom. For extra points in style and irony invite your cycnical friends to dinner with stuffed marrow in the main course and serve the rum afterwards in pretty small glasses - half a wine glass will do most people - and gain a reputation for King/Queen of Marrows (use of, not necessarily growing!). If they drink more than a glass full you'll probably have legendary folk songs telling the tale of your success, but record it, 'cos no one will be able to recall it the next day! Hope it works with the courgette. FIVE Pints!!! WOW.... that's got to be worth a try!! I'm not at all sure it's gone according to plan, anyway (whichever plan that may be). The marrow dripped for a few days, until there was an inch of brown liquid in the jar. Then it stopped dripping for a couple of weeks, so I stuck a prong in the bottom and it started again. But by this time it had all started to do mouldy, smelt bad, and was attracting swarms of fruit flies. A few days ago, it had to go. Now I am left with a pint or two of brown stuff that is fizzing away in the jar with a frothy head, looking not unlike some badly kept beer. Eeeuuoow!!! That looks scary! If it's bubbling, it's giving off gas so don't seal it with the lid. I'm not convinced you've got alcohol in there. Isn't there some formula where yeast eats sugar a gives off alcohol and CO2 as a by product. plenty of liquid though. Would love to encourage you to try to turn it into something drinkable, but not certain if you'd end up with food poisoning from it. I think this will have to go on the things to do list. Which should probally be renamed to things that I have every intention of doing but will only remember when I am nowhere near a place where I can. I do want to give it a go though! "That bubbling and foaming is natural. It will turn into a scum floating on top. Leave that scum on untill you are ready to drink. When you are ready to drink skim that scum off and discard "Do NOT STRAIN it" your good stuff is under it. " It sounds like you have natural or wild yeast naturally present in that festering goo which is working hard for you, apparently wild yeast doesn't have a huge tolerance to alcohol, so I guess my recipe made something incredibly alcoholic because it added extra yeast. Some other reports suggest that Marrow/Courgette/Zucchini can be treated as pretty much the same thing for this kind of brewing. "Some people that make it in 55 gal drums sifle from the middle. Make sure your sifleing hose is sucking from halfway between the top and bottom. This is the easy way to take off about 5 gal at the time as it leaves the top and bottom undisterbed. Also i've only made Buck with red meated watermelons, I suppose those others will work. Over ripe melons in the field have lots of sugar in them. I think harvested melons that have become overripe from age will most likely work the same." Apparantly you take the juice and bits from broken watermelons being harvested from the field, throw it all in a covered (not sealed) drum and leave it to work its magic in the sun. Look forward to hearing how it all turns out! my mother used to make this when I was younger the stuff used to come out very pale in colour and was incredibly sweet, I always used to have a row for pinching it ! But we only ever used get a very small ammount out nothing ammounting to pints - maybe because we were all sneakily drinking it and pretending nothing had come out ! My mother also made a mean sloe gin and has done a strawberry vodka this year as my Dad's strawberries went a bit bonkers and cropped like mad. Right, well I guess there's the making of a plan here: wait for the gassing to stop, scrape the scum off and try it with trepidation. Wonder if it'll look more attractive by then. Actually, it doesn't smell too bad, at the moment, with a wiff of alcohol to it, too. I decided to try this and let some courgettes grow bigger. I've just started one (yes, at midnight) as a trial. The first thing is how to get the seeds out. I used a longish spoon but it can't reach far enough so I cut it across again further downto allow access to the bottom half. How did others manage this? I hope that the liquid will drain and that it doesn't need to be leak-free over its whole length. I didn't fancy using electrical tape so I used sellotape for now and will try to think of something better later. I can't think where to hang it or what container to use so its sitting on a funnel resting on a pint glass and I'll drain that into a plastic bottle as it collects. The whole thing is in a cardboard box for now to provide some sideways support. Yes, I've made a mess of it. Is there any hope? Glad to see someone else is having a go, too. It's all a bit experimental, so don't expect any good advice from me. I used a long carving fork to get the seeds out, carefully prodding and twisting until they all seemed to be out. I was surprised how quickly all the sugar somehow magically changed into liquid - I fear your cut half way down might be a weak point. Also, in a few days, the firm marrow will become rather soggy and floppy as the sugar seems to sort of digest the innards, so I think you will need to hang it up somehow. The liquid I got has now almost stopped bubbling, but still doesn't look very appealing. I think I'll give it a while longer before sampling it. I've got a marrow in my veggie box this week... at least I think it's a marrow.... very hard skinned right??? Not sure I say they had 'very' hard skins, though they do seem to get tougher the longer they are on the plant. A marrow is a squash, but the skin is nowhere near as tough as a butternut squash, for example. I noticed an extremely odd looking marrow ar the organic market the other week; at least that's what they said it was - right colour, but much bigger than usual and bell shaped.